Preservation partners across New Mexico recognize May as Heritage Preservation Month with tours, celebrations and special events. 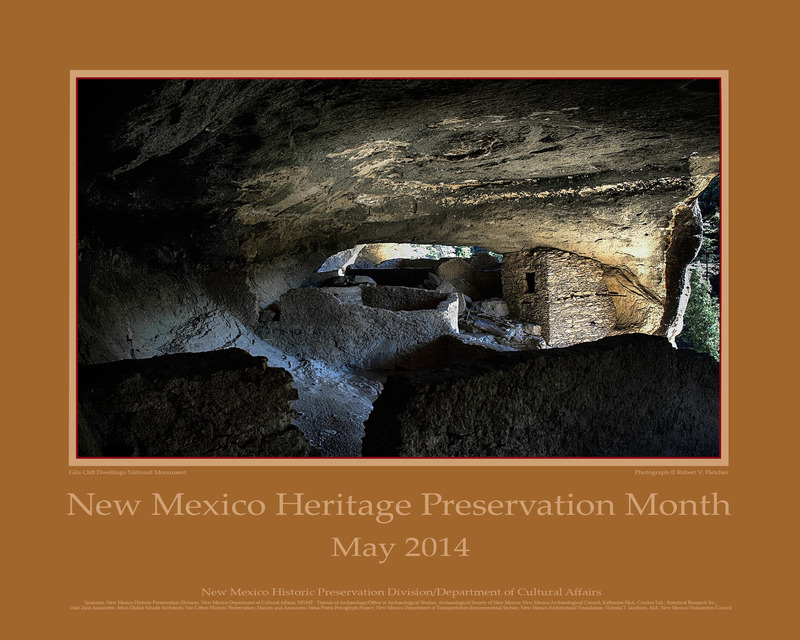 The New Mexico Architectural Foundation is pleased to sponsor this year’s Preservation Month poster, which features the Gila Cliff Dwellings in Grant County. During May, the Historic Santa Fe Foundation is hosting an exhibit that celebrates 20 years of the posters – “Preservation Month Posters Through The Years” – in collaboration with the New Mexico Historic Preservation Division and the New Mexico Heritage Preservation Alliance. The exhibit runs through the end of the month at El Zaguán on 545 Canyon Road in Santa Fe. Scheduled throughout May in many New Mexico locations are tours of historic buildings, districts, and archeological sites, lectures and demonstrations, festivals, and workshops.